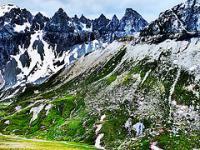 The Swiss Tectonic Arena Sardona is a significant example of the process of mountain building. 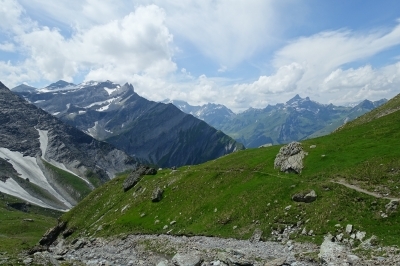 The area of this "tectonic arena" encompasses 32.850 hectare of mainly mountainous landscape in 19 communities between the Surselva, Linthtal and Walensee. 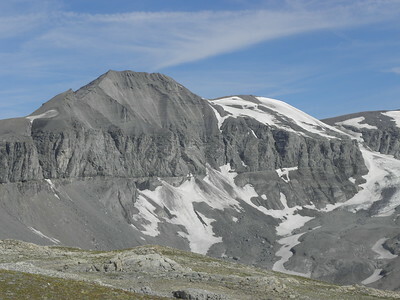 In the arena are a number of peaks higher than 3000 meters, such as Surenstock (its Romansh name is Piz Sardona, from which the name comes), Ringelspitz and Pizol. 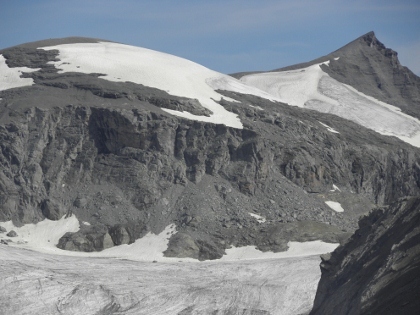 The Tectonic Arena contains a major break in the Earth's crust: the Glarus thrust. 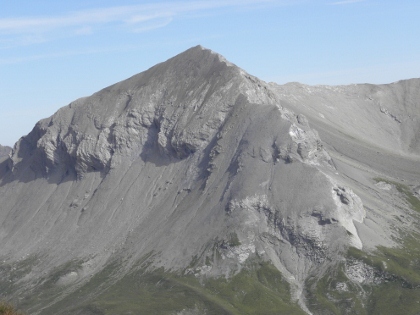 The Glarus thrust is a well accessible example of thrust faults in general, and has as such played an important role in the development of geological knowledge on mountain building. For my visit I chose the approach from the south side. Two chairlifts and a cable car ride from the town of Flims brought me up on the Fil de Cassons, at the altitude of 2634m. This mountain ridge itself is part of the core zone of the WHS. The best thing however is the view on the surrounding mountains: no less than 555 Alpine peaks can be seen from here on a clear day. And although IUCN did not value the scenery as exceptionally beautiful, I found the 360 degree view pretty spectacular. There's an easy hike at the ridge of the Cassons with displays to tell you all about the geology, flora and fauna. In preparation I had tried to read the nomination file for this WHS, but it seems to have been drafted specifically for geology experts. It includes so many specific words that I did not really got a clue what it all is about. The only element that I can reproduce is that older rocks occur here on top of younger rocks, an effect created by the movement of the earth crust. The different effects this has on the layout of the mountains can indeed be easily seen from here. In what was dubbed by some a mini meetup me and Philipp ventured into the Sardona Tectonic Area. It was a mostly sunny July day when we set out from Flims to cross the mountain range at the Pass dil Segnas and descent on the other side to Elm. It all started with a bit of a misunderstanding. Philipp had send me a trail map of the 6th day of the world heritage trail. I took it to mean he wanted to do the full trail when his original intention was to do only a part of it. He didn't see the need to correct me on my misunderstanding. Or put in any effort to clarify what the Swiss mean when they categorize a trail as hard. So we did the full trail. We met in Chur in the morning and took the bus to Flims. In Flims you can start the trail or catch a lift up into the mountains. There are multiple stops on different alitutde levels. We decided to go up to the first stop, Focca, from where we started our 8h, 19km, 1500m altitude difference (up and down) hike. On the Flims side it's a fairly steady climb on good trails in a beautiful landscape. For parts of it we followed a mountain river. When we reached the upper plateau at Camona de Segnas it started to rain. Philipp hadn't bothered to bring a rain coat. And I noticed that I had forgotten mine in the hotel room in Chur. The Camona di Segnas offers nice views of the different layers of mountain, the OUV feature of this area. You can clearly see the border between the different rock formations. For those not too enthusiastic about hiking, there is also the option to go by lift to the uppermost station. I am not sure though that you can see the Martin's Loch (hole) from here. I think you need to hike a bit up in the direction of the pass. The last climb up from Camona di Segnas to the Pass dil Segnas got rougher, albeit it stopped raining. We crossed plenty of rock and snow fields with the last stretch to the pass especially challenging. But we made it and stood on the mountain pass. From here we made our descent to Elm. The Elm side is steeper and there are essentially no even stretches to give you some relief. It's more or less a constant, strenuous descent. In the end I must admit that I pushed past my limit. While I am happy that I made it down in one piece and we got some amazing views, my legs complained for the better part of the following week. Philipp meanwhile was just smiling along. It seems being a great mountain guide is something the Swiss get with their passport. Both Elm and Flims are served by busses that connect you to the Swiss Rail network and the rest of Switzerland. From Elm you can take a lift for a minor part of the way up. From Flims you can take multiple lifts to reach the upper plateau at Camona da Segnas. The area offers multiple hiking options that you can tailor to your needs. If you want to go all in, there is the aforementioned 6 day hiking trail, the heritage path. For daytrippers, Flims and Elm seem the best spots. The Flims side to me is the easier ascent/descent option as it's not quite as steep and provides three different locations where you can opt for a lift ride up/down. The Elm side meanwhile only has a single lift that operates less frequently (on demand) and does not take you all that high up. However, from the end point you can see the famed Martin's Loch. If you plan to follow our example and hike across the mountain range, I would probably opt for Flims to Elm as the Elm side is steeper. I am not sure I would have made it up on the Elm side. However, my knees were hurting a lot coming down, so maybe ascending on the Elm side would have been the smarter choice. Looking back we should have returned the same way we came, back to Flims. In any case bring good shoe, sufficient water and be in reasonable shape. Looking at the weather forecast also is a must. I visited this WHS in June 2014. I based myself in Flims and already getting there by car made my trip worthwhile. About 100m from the tourist information centre, I bought my tickets to the Fil de Cassons. From Flims I went up to Foppa (1420m) by chairlift, up to Naraus (1843m) again by chairlift, and up to Cassonsgrat (2695m) by cable car. The return trip cost around 35 euros. At every stop there are information boards, a bar or restaurant, a panoramic viewpoint and toilets. I suggest taking your time to acclimitise at each stop to avoid any possible altitude sickness. The temperature difference from Flims to Cassons was around 18 degrees so wear layers and bring a good windjacket and good hiking boots. Once I arrived at Cassonsgrat, I hiked at the panoramic viewpoint with the UNESCO information boards and a clear view of the Tschingelhörner. From there I ventured on a strenuous hike on a trail called "Fuorcla Raschaglius" (30 minutes) and another trail called "Pass dil Segnas" (2.5hours). Although I visited in late June, it was quite cold and there was quite a lot of snow left. After spotting several marmots and alpine birds and flora, I found my way back to Cassons and down to Flims. I visited the Sardona range from two sides. From the north by the bergbahn from Flims, accessed by postbus from Chur. 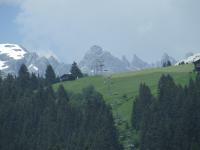 The next day I approached from the south, by cable car from Elm, accessed by Postbus from Schwanden. More of the tectonic area is visible from the south side. 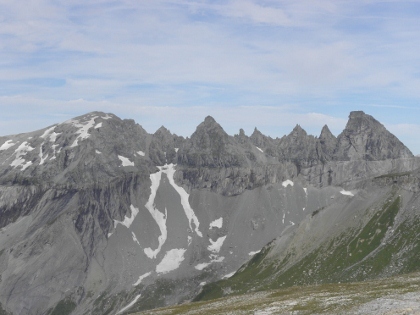 The most impressive mountains of the Swiss Tectonic Arena Sardona are the Tschingelhörner. To go there I suggest you travel to Elm, a small picturesque village in the Glarus region. The village is easily reached by car. Otherwise take a bus from Glarus (the city) as there is no train. In Elm you will find a small funicular that brings you close to the mountains. To get a closer look the only way is to hike. There are (quiet expensive) 1 to 2 days guided tours on weekends that bring you close to the Tschingelhörner. To see the whole area you can hike from Elm to Flims. The trip takes about 6.5 hours and shouldn't be done by inexperienced mountain hikers. Glaciers: Inludes the summit of Piz Sardona 3055m - "To the east of the summit you find the glacier "Sardona-Gletscher" and to the south the glacier "Glatscher dil Segnas""
Eocene: Entlang der weit herum sichtbaren Linie, der "Glarner Hauptüberschiebung", schoben sich 250-300 Mio. Jahre alte Gesteine über eine Distanz von 35- 40 Kilometern auf viel jüngere, 35-50 Mio. Jahre alte Gesteine.